Revealed for the first time at the world’s largest travel retail exhibition, The Royal Legacy of 1745 was awarded a Gold Medal for Best Drinks Launch at TFWA Cannes 2009, a category which included strong competition from the likes of Remy Cointreau’s Louis XIII Rare Cask and Nicolas Feuillatte’s Cuvee 225 Rose Champagne. Celebrating the centenary of the first commercial bottling of Drambuie in Edinburgh in 1909, The Royal Legacy of 1745 is a sublime interpretation of the original royal spirit enjoyed by Bonnie Prince Charlie in 1745. At its heart remains the Prince’s legacy – his secret elixir of exotic herbs and spices sourced from around the globe and unchanged for 260 years. Today, Drambuie’s whisky blenders have the luxury of hand picking a bespoke selection of Scotland's finest rare aged malts to complement the elixir’s distinctive flavour notes. Miranda Rennie, Marketing Director for Drambuie Liqueur Co. commented: “We are incredibly pleased to have the quality of The Royal Legacy of 1745 recognised in the Drinks International Awards. The endorsement from one of the biggest spirits publications adds great value to the launch communications to both trade and consumers. The Drambuie Liqueur Co. Ltd is an independent, family owned business that has been producing the world-renowned Drambuie Liqueur since 1909. Drambuie is regarded as one of the Top 5 Liqueurs ever produced (Paul Pacult, Spirit’s Journal, 2008) and remains a Top 50 global spirit in volume (IWSR, 2008). 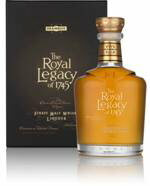 The launch of The Royal Legacy of 1745 is a major step in Drambuie’s marketing strategy for GTR, and an important part of its overall rejuvenation strategy to reposition the brand to appeal to new and younger consumers.